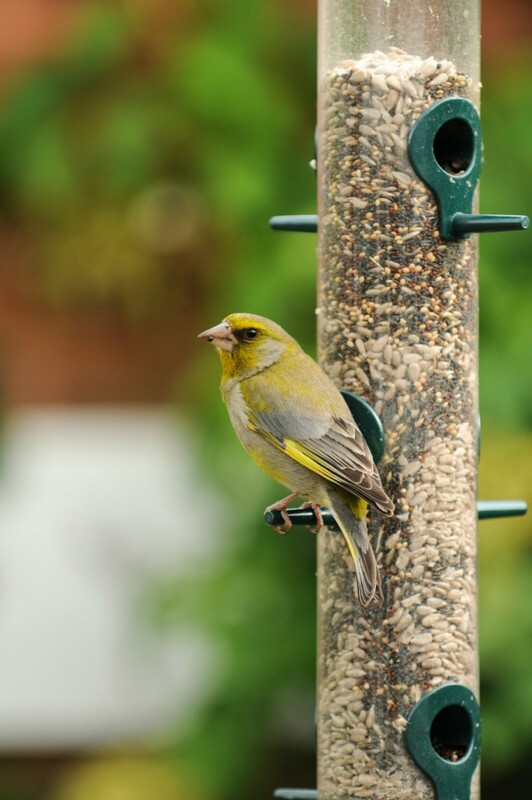 Filling your bird feeder without spilling seeds everywhere is easier if you use some simple tools, many of with you already have around the house. This is a guide about filling birdhouses and feeders. Just a little reminder to fill your bird feeders this winter. Many birds may fly south, but those in the northern states have birds come in the winter, too. Add a birdseed bell and suet blocks on a low branch near the feeder and you can enjoy watching the little birds come to feed on bitter snowy winter days. 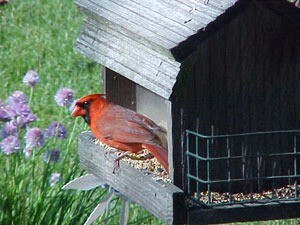 Here is a photo of a male cardinal that comes to my feeder along with his mate, all year round! I reuse plastic milk jugs with the end cut off as scoops for birdseed, and I reuse plastic juice bottles to store the seed in. I make a funnel out of a milk jug by cutting the end off and placing the small end into the juice bottle. Then I just scoop the seed with one reused milk jug and pour it into the funnel which just fits on the top of the juice bottles. This way I only have to fill the jugs about once a week and just grab a couple and hike up the hill to fill my bird feeders. A good way to reuse materials without having to buy scoops and funnels! To fill your bird house faster make your own funnel by cutting off the bottom of a clean 2 liter bottle. Cut off what you want (the choice is yours) then put the neck of the bottle in the bird house and filler up. It's fast and less messy. Here's a cheap and easy funnel to fill your bird houses. An empty 2 liter bottle cut (whatever length you want) then just put the cap end in the bird house, pour as much as you like and this is "fast".